We love chocolate and you so much that we are hosting several Guided Chocolate Tasting Events to bring our two loves closer together! "We got to hang out and brew with Morgan from @queerchocolatier today! The Fudge Pop Baltic Porter will be out on February 9th!" 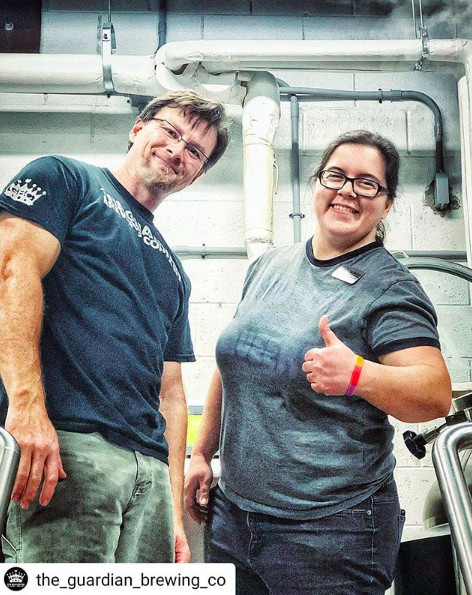 With the spirit of local collaboration and love of community in mind, Queer Chocolatier and The Guardian Brewing Co. brewed a Baltic Porter that included 5 gallons of chocolate syrup. The chocolate syrup, itself, is a miniature collaboration as it included several growlers of GBC's Ogre Stout. The dark, rich chocolate syrup will make the Baltic Porter pretty f*cking fudgy! Come out to Muncie for the release of this beer and celebrate Valentine's Day early with the Fabulous Funcie Femmes burlesque troupe putting on an incredible show! Support Local. Drink Local. Indulge Local. 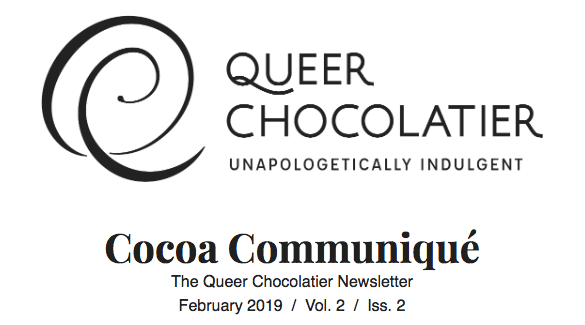 Bursting with raspberry flavor, one of our most romantic and long-awaited truffles is on the scene at Queer Chocolatier! Raspberry Balsamic Vinegar Truffles are a grown up, fruity, and complex truffle flavor. Buy a box for yourself or someone you unapologetically love today! On Thursday, February 21, Cheri Ellefson Roddy will be speaking as a part of the 2019 Indy Pride Educational Series. From business practices and places of worship and hospital policies, how do various industries show up for queer identities and communities? How does the queer community stand in solidarity with trans, gender non-binary, and the multitude of queer identities and communities? How does solidarity differ from ‘allyship’ (if at all)—and is this difference useful? Be sure to reserve your ticket today to participate in this exciting event! Tidbits of news, books, blogs, and podcasts featuring current trends, deeper knowledge, and new-to-you conversations! Queers reclaiming Valentine's Day is the thesis of Elite Daily's piece on how the traditionally heteronormative holiday has a place on the calendar for queer folk, too. Queer folx still are frequently underrepresented in media and in marketing, but as we often do, a strong current of counterculture is manifesting in the ways we are celebrating our unapologetic and authentic selves. This also is the case for those who are unpartnered and single; a holiday that professes to be about love should not be so narrowly circumscribed. As the article states: "There is no "right way" to be queer, and there is no "right way" to celebrate Feb. 14." What about that word "Queer"? The Columbia Journalism Review explored the reclamation of the word Queer in their Language Corner series. As noted in the article: "The Dictionary of American Slang says 'in the early 1990s queer was adopted as a non-pejorative designation by some homosexuals, in the spirit of "gay pride.” The OED says that transformation began in the late 1980s.'" This history is important as it is during the AIDS crisis and the villainization of gay men was at its peak. By reclaiming the word "queer," there was the effect of disarming persons and institutions that were ignoring the crisis at best or were aggressively homophobic at worst. However, the term "queer" has evolved beyond describing only homosexual individuals but also to help folk explain and communicate their gender identity. "Genderqueer" is a way to illustrate one's gender identity when they don't identify as either a man or as a woman; perhaps they identify as a mix of both or neither at all. It should also be noted that there is not a ubiquitous acceptance of the term "queer" within the LGBTQIA2+ community. The history of its pejorative usage still stings some of the members of the community that heard the word spoken more before its reclamation. So, to that end, if you do not identify as queer and you are speaking about someone who is not cisgender or straight identifying, it would serve you wall to ask permission to use the term before bandying it about carelessly. As for me personally, I appreciate the word "queer" in the sense that it unifies and connects me to others who are in the LGBTQIA2+ community. You can use "queer" to describe me so long as you are not using it in a malicious way. I also hold space in our shop and online for folx to feel free to ask question related to language and terms so that you can become more comfortable in learning how to use words that are often used to describe our community. This piece about how straight owners of queer businesses can cause actual harm. This list of awesome queer and/or queer-friendly Sundance Films. This post by Autostraddle working to Queer Your Ears by giving you new music from queer and/or trans* artists. Such is the power of organized communities! In San Francisco, where nearly everyone is becoming increasingly priced out of living in rapidly-gentrified areas, Honey Mahogany and other trans* political activists have succeeded in creating a Transgender Cultural District in the city. "With gentrification, we're seeing the continued destruction of a lot of the old buildings," Mahogany says. "With the destruction of these buildings, we're also losing the stories that go along with them." Read up on how the designation of cultural districts like the one Mahogany and others created are not only representing great stewardship of history but also adding to the economic development of local communities! 2019 is the 50th Anniversary of the Stonewall Riots. It is vital to our community that we know our roots and history, and that justice is done in the retelling of our stories. Often, Stonewall is cited as the genesis of the Pride movement, but not only is the recounting of this event often told with the erasure of the trans women of color who kicked off the riot (re: not parade), it was not the first act of radical resistance in our nation by trans* folx. As mentioned in the NPR article above, the transgender cultural district in San Francisco includes Compton's Cafeteria, which is recognized (but not widely) as one of the first violent riots between the transgender community and city police. We need to recognize that there is significant economic violence associated with unchecked gentrification where community members are not given a seat at the table. The tenuous telling of trans* history, especially the story of Compton's Cafeteria, would be almost entirely erased if there weren't groups of activists working diligently to preserve physical locations. This article reporting on the Japanese Supreme Court upholding a law requiring the sterilization of transgender individuals who wish to legally change their gender. This piece discussing the relationship between gender dysphoria and transgender individuals: is dysphoria a requirement and/or experienced by all folx who are trans? A chocolatier isn't worth their salt (or cocoa powder) if they aren't passionate about guiding you through the experience of tasting and exploring the wide world of chocolate. 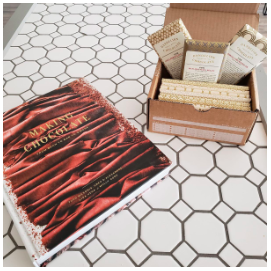 Much like I enjoy bringing our Guiding Chocolate Tasting Events to our local community, so do many other chocolatiers and chocolate enthusiasts. Read up on some tips (from other chocolatiers, but also feel free to ask me questions!) on how to find the chocolate you're looking for! Another New England chocolate fiend has some words of wisdom to share related to your chocolate search: shop local! A renowned craft chocolate company and other companies owned by women and/or people of color are given the short end of the financial stick by a failed startup not fulfilling payment obligations. In the Spring of 2018, Munchies underwent a company reorganization, laying off almost a third of its employees and not notifying vendors of their internal financial condition, choosing to instead email customers in San Francisco that their company operations would cease. Dandelion Chocolates was among other food businesses that are owed thousands of dollars from the company. Again, economic harm and violence is done to those who are among the most vulnerable in their own businesses for the sake of venture capitalists extracting as much in resources as possible without maintaining a sustainable and responsible business model.